Your new lock screen photos have arrived, courtesy of NOAA’s heavily hyped GOES-16 Satellite. The orbiter, launched in November 2016, can take high definition photos of Earth every 15 minutes and one of the continental US every five minutes, according to a press release. Its combined speed and resolution will help scientists make more accurate forecasts, and allow them to spot severe weather earlier. But the COOLEST part is obviously the pretty pictures we’ll get to see. Today, NOAA released the first photos from GOES-16, and needless to say, they are spectacular. This 16-panel, visible and infrared look at the Western Hemisphere is like pop art. Andy Warhol would be jealous. Currently, GOES-16 is in a geostationary orbit 22,300 miles above Earth. In May 2017, NOAA will reveal the satellite’s planned location—after that, it will launch GOES-S, the second satellite in a series of four future Earth-observing spacecraft that’ll extend the agency’s weather-monitoring capabilities out to the 2030s. The launch date for GOES-S is TBD. For now, NOAA scientists are celebrating their first step into the era of HD weather-monitoring. 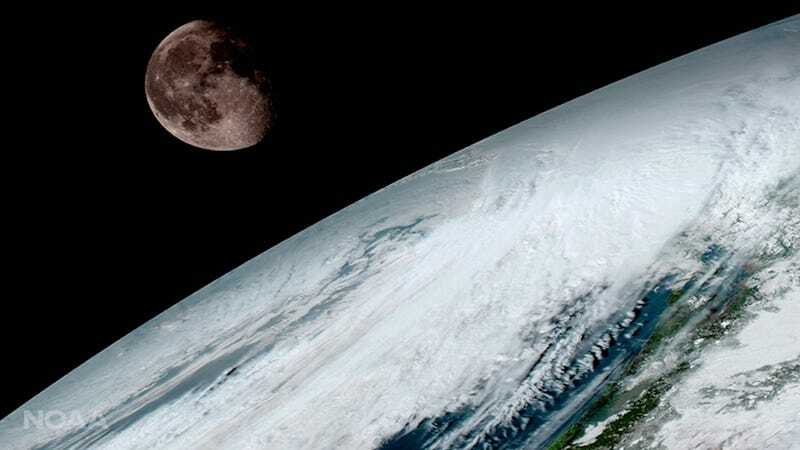 “One of our GOES-16 scientists compared this to seeing a newborn baby’s first pictures—it’s that exciting for us,” Stephen Volz Ph.D. director of NOAA’s Satellite and Information Service, said in a press release.